Super Typhoon Mangkhut was seen on Japanese satellite sensors Tuesday night as it made its approach towards northern Philippines where it is expected to hit Friday, September 14. The tropical cyclone is currently packing maximum sustained winds of 259 kilometers per hour with gusts reaching almost 315 kph, according the U.S. Joint Typhoon Warning Center. Mangkhut was spotted by the Himawari-8 satellite in enhanced color, as well as by various scientific instruments carried by the Japanese weather satellite monitoring the Asia-Pacific. 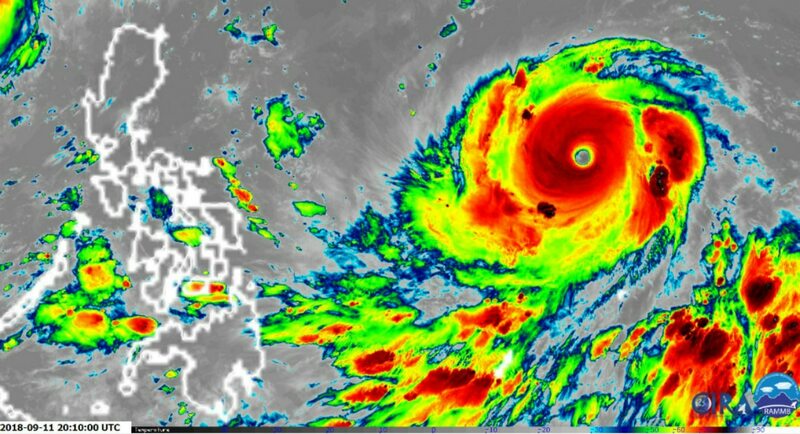 The images, which were processed by the U.S. National Oceanic and Atmospheric Administration, also showed Mangkhut on infrared as it approached the Philippines. 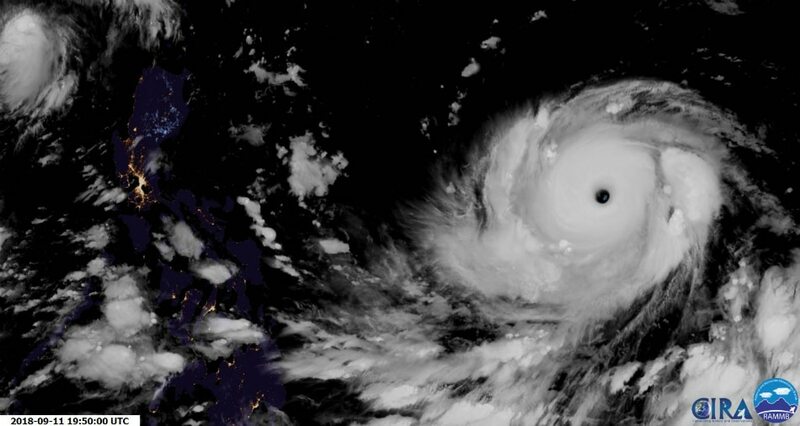 Data recorded from Himawari 8 is made freely available for use by meteorological agencies in other countries, such as the Philippine state weather bureau PAGASA. The tropical cyclone is expected to enter the Philippine area of responsibility Wednesday afternoon and will be locally named "Ompong." The typhoon remains on track to threaten Northern Luzon and may traverse the Cagayan-Batanes area, PAGASA said on Tuesday. The National Disaster Risk Reduction and Management Council (NDRRMC) on Tuesday morning raised the highest alert in a 3-step system as Mangkhut barrels towards the Philippines. Under the red alert, all concerned agencies are tasked to prepare for typhoon and send representatives to the NDRRMC headquarters, said its spokesperson Edgar Posadas. Posadas said Mangkhut will intensify the southwest monsoon (habagat) which will cause rains over Cagayan, Isabela, Apayao, Kalinga. Abra, Ilocos Norte, Batanes and the Babuyan islands. He said a P1.7-billion augmentation fund for relief aid from the Department of Social Welfare and Development was on standby for these areas. The NDRRMC official said telecommunication companies also committed to provide emergency lines in case there are power or signal outages. Posadas said because the diameter of the typhoon measures around 600 kilometers, its outer bands may also affect Metro Manila in the coming days. 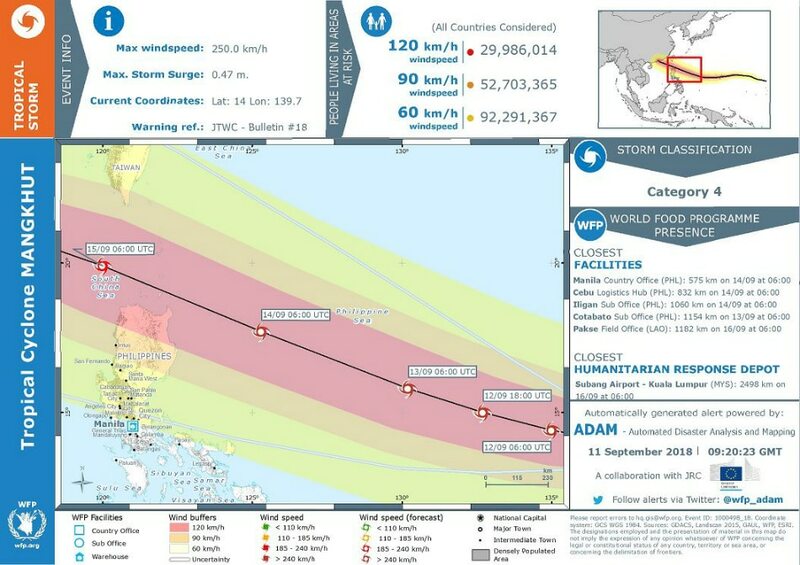 The U.N. World Food Programme has also issued a potential disaster analysis map for Mangkhut, with Cagayan, Apayao, and Ilocos Norte at direct risk.